It’s a difficult time of year for many people: Instructors are looking at how many lectures are left before final exams, and starting to panic about how much material hasn’t yet been covered! We are planning field seasons, applying for research permits, juggling meetings, and starting to think about how the summer’s work-life balance will play out. As we approach the end of term, stress levels in the classroom are also building. Students are working madly on term papers, scrambling to get things organized for summer jobs or internships, and looking ahead to final exams. It’s busy. Everyone is too busy. The days are too full and it’s not easy. I teach with chalk, and in my lecture hall there’s a vertical sliding chalkboard. When I enter the room, the front, upper board is where I start the lecture and as that board fills up, I slide it up. 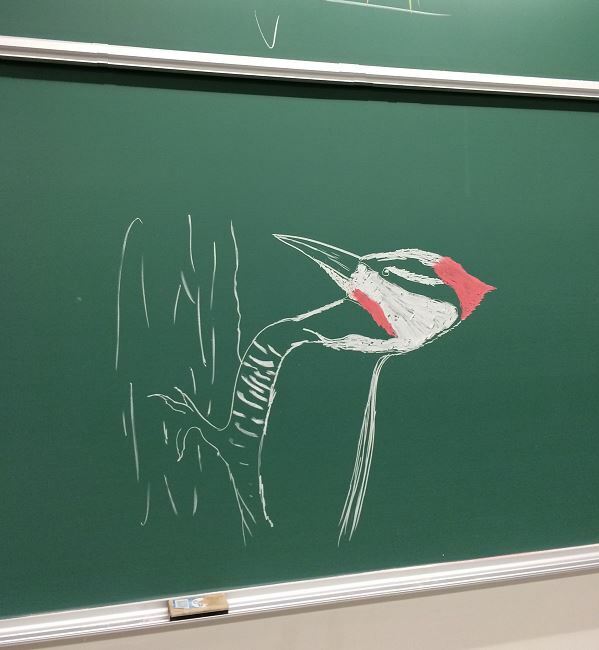 Last week I was surprised by a beautiful woodpecker that someone had drawn. I was “art-bombed”: this drawing was ‘revealed’ about a third of the way into the lecture. It happened on #taxonomyday, which was fitting. Another gift: this bird is an island. This is no longer a one-hit wonder! 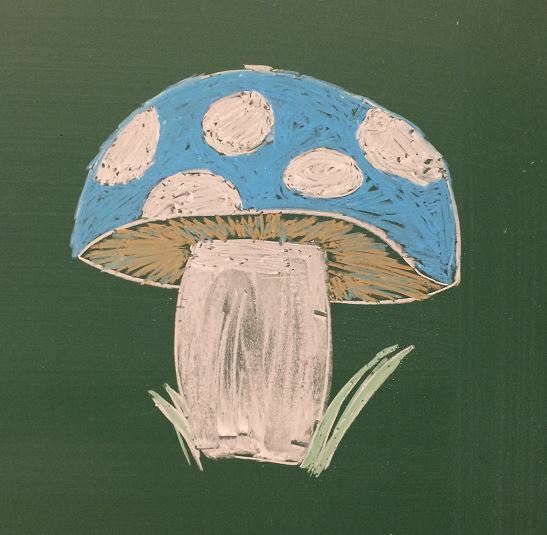 An unnamed student is taking time before lecture to leave some art for all of us. I don’t know who the student is, but this art brings joy to all of us, and provides a smile at a difficult time of year. It also allows me to modify the lecture and link the art to whatever I might be teaching. 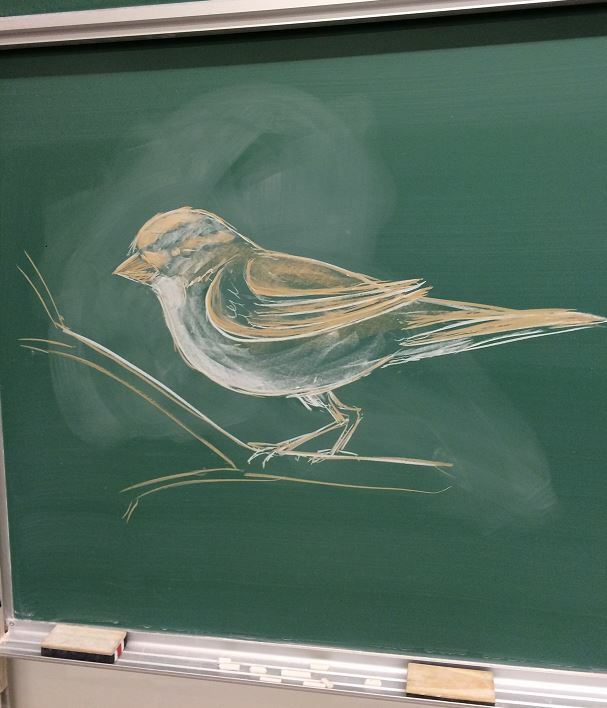 For example, lecturing about island biogeography on Monday, with a drawing of a sparrow on the chalkboard, allowed us to consider the bird as an island, and its fauna (feather mites, lice) colonize that island, and perhaps follow the predictions of MacArthur and Wilson’s equilibrium theory of island biogeography. Dear unnamed student: know that you are doing something very special. You are taking time and energy out of your busy life to simply bring joy to others. Thank you for the ephemeral art. An interesting post from Chris Buddle about a rogue artist in his class. What a wonderful way to start your class every week! Has this ever happened in your class?